Home » Faith » Why Am I Not Praying for You? How often do you find yourself saying, “I’m praying for you”? How often are you praying for that person? Do you forget to pray, or is it just a kind way of letting someone know of your concern? I don’t know about you, but I have yet to find someone who says, “Prayer is the spiritual discipline I have mastered.” When I speak with other women and we talk about areas of our spiritual life that are lacking, prayer always comes to the top of the list. So, how do we truly begin praying for others and being more intentional about our prayer life? This subject has been at the forefront in recent months with the release of the movie, War Room. 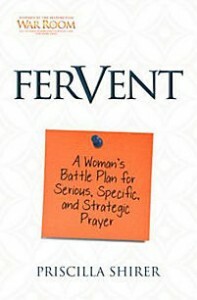 Popular Christian speaker, author and now actress, Priscilla Shirer, tackles these issues in the book, Fervent: A Woman’s Battle Plan for Serious, Specific, and Strategic Prayer. The book, published by B&H Publishers, is a companion piece to the movie. It is more than just a book “about” prayer. It is a “battle plan” you can put into practice. Here are a few tips on how you can become more intentional in your prayer life, including suggestions from Shirer’s book and my own personal experience. Know your enemy. Ephesians 6 describes the spiritual armor Christians need to use when fighting against Satan. While some people ascribe to the theory of “the best offense is a good defense,” I believe spiritual battle involves going on the offensive. How? With prayer and God’s word. If we are fighting an unseen enemy, let’s go after him with the fuel and power of prayer. Pray God’s Word. When you combine God’s Word in prayer, you are affirming what God has already said. One of the ways I like to pray God’s Word is by praying through a Psalm each day. As I read through the Psalm, I allow God to remind me of the needs around me, and it causes me to remember the character of God. I learned how to pray through the Psalms with a simple plan outlined by Dr. Donald Whitney, professor of Biblical Spirituality and associate dean at the Southern Baptist Theological Seminary. It has revolutionized my quiet time and prayer life. He released a book this summer outlining this plan entitled, Praying the Bible. Keep a prayer journal. I’ll admit—I used to be better at keeping a prayer journal than I do these days. I’m not sure how I got out of the habit, but writing down prayers solidifies my need to bring requests before my heavenly Father. It is a great way to be reminded of God’s faithfulness to answer prayer when you look back and see His hand in your life. I love the part in the movie when answered prayers are framed on display for everyone to see. Pray when prompted and pray in the moment of need. Because I am in vocational ministry, there are many times during the day I am confronted with prayer needs. Because I know I’m prone to forget them, I stop at the moment I’m prompted and just pray. If I’m speaking with someone and they ask for prayer, I literally stop right then and pray with them. Also, don’t neglect those times when God brings someone to your mind during the day. Allow the Holy Spirit to work through those moments and pray when He prompts you. If you are looking for ways to be more strategic and intentional in your prayer life, pick up a copy of Fervent. Better yet, share your comments and you’ll be entered to win a free copy of the book, courtesy of B&H. Millennial Monday: What do you love?